Truck 6 carries a full compliment of ground ladders as per NFPA Specifications. Truck 6 serves as a quint by design and carries multiple crosslays of 1 3/4″ and 2 1/2″ Hoses. 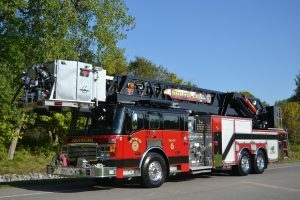 Truck 6 also carries Various Firefighting Hand Tools, Saws, Smoke Ejectors, Rope Rescue Equipment, R.I.T. Equipment, and EMS Supplies. Truck 6 is second out behind the engine from the main hall. 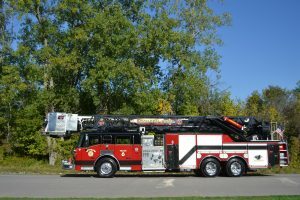 Truck 6 is also used for all R.I.T. responses and truck requests inside and outside of the town.